Image caption Only 6% of the documents are classified "secret"
Most of the diplomatic messages released by Wikileaks have been traced to a US defence department network, known as Siprnet, used for the exchange of classified information, media reports say. Ironically, Siprnet (Secret Internet Protocol Router Network), which was set up in the 1990s, was expanded as part of moves after 9/11 to allow classified information to be shared more easily and prevent failures of communication between different intelligence agencies. It is designed for exchange of information up to "secret" level - the level for information that would cause "serious damage" to national security. It is thought about 2.5 million US military and civilian personnel have access to the network. However, Siprnet is not recommended for distribution of top-secret information. Only 6% (more than 15,000) of the documents have been classified as secret. Another 40% were "confidential", while the rest were unclassified. Siprnet was identified as the source of the leaked messages because they had the tag "Sipdis", meaning Siprnet Distribution, as part of address codes that headed them. Siprnet uses the same technology as the internet, but has dedicated and encrypted lines that are separate from all other communications systems, according to a defence department users' guide. However, the guide says that technological advances in storage devices have made it easier to remove classified information from secure areas. Meanwhile the network has become easier to access around the world since 9/11. The attacks led to the State Department setting up the net centric diplomacy initiative, allowing its own information to be shared on Siprnet. The vast majority of US embassies are now connected up to Siprnet. Speaking to BBC News in July, US intelligence analyst Catherine Lotrionte said data-sharing was necessary for effective intelligence work, and the risk that it might make large data breaches easier was simply "the cost of doing business - the downside is that someone may break the rules". No-one has been charged with passing the diplomatic files to Wikileaks but suspicion has fallen on US Army Private First Class Bradley Manning, an intelligence analyst arrested in Iraq in June and charged over an earlier leak of classified US documents. Wikileaks has in the past denied that it received any documents from Pfc Manning, and says it is technically impossible to know if he is indeed their source. According to claims by Adrian Lamo, a former hacker, Pfc Manning told him in online chats that he removed information by burning it onto a CD. Mr Lamo claims that Pfc Manning told him that he disguised his activities by pretending he was listening to music by Lady Gaga. 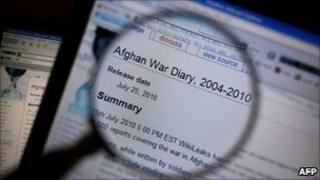 It is alleged that an online security system to detect suspicious use of Siprnet was switched off on computers used by the US military in Iraq following complaints that it was inconvenient, the UK's Guardian newspaper reports. Also, analysts say the possibility that someone in a base in Iraq could potentially access cables about Iceland violated the principle of "need to know" in intelligence, on which the Siprnet security system is supposedly based.